Dive in to the Deep Blue Sea and find treasure and adventure in an underwater world. The mystery of the aquatic deep sea people of Avalonia unfolds as you discover the scattered fragments of their Sacred Amulets, salvaging treasure along the way. The plot thickens as the Amulets are assembled and their powers come to life. Who can be trusted? 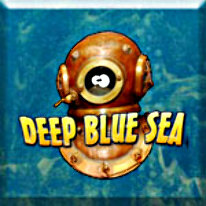 Deep Blue Sea continues to entertain with engaging and challenging gameplay, unique features and power-ups, and a 100% original soundtrack.